If you notice strange sounds coming from your AC unit, it might be time for air conditioner repair Spring TX. Keeping your air conditioner in good repair is an important part of home ownership. Malfunctioning units can cause discomfort at best, and be hazardous at worst. Some homeowners may be tempted to try to take on AC repair in Spring, Texas themselves. Some people may mistakenly believe that this will save them time and money. Unfortunately, DIY repairs rarely work out well. More often than not, homeowners have to seek professional assistance in the end. You can avoid the stress and potential dangers of DIY repairs by calling a professional first. If you are looking for Spring Texas AC repair, you can contact Houston Admiral Air Conditioning and Heating. They have been operating in Texas for over 50 years. This extensive experience gives them the ability to work fast and with accuracy. They are happy to offer their customers 24/7 service, without any hidden fees for after-hours calls. You can learn more about their wide variety of repair services by visiting https://goadmiral.com. Prospective customers can also contact them by calling 281-876-9400. Looking for professional AC repair in Spring, Texas will save you a lot of time. It might take a while to find the perfect service. However, once you do, they can complete your repair fast. Taking the time to look for a reputable service is important. You want to be sure you trust your family’s comfort to only the best company in town. Be sure to look for one with highly trained and certified technicians. AC repair is a lot more complicated than many people believe. Learning the ins and outs of air conditioner repair takes a qualified technician many years. It is not a skill that you can learn by watching instructional videos online. It will almost always take the average homeowner longer to complete the repair. This is a longer period of time that your family is without cool air. Most homeowners have other jobs as well. This can put further delays in your repair project. Avoid wasting your time on DIY repairs and call Houston Admiral today. 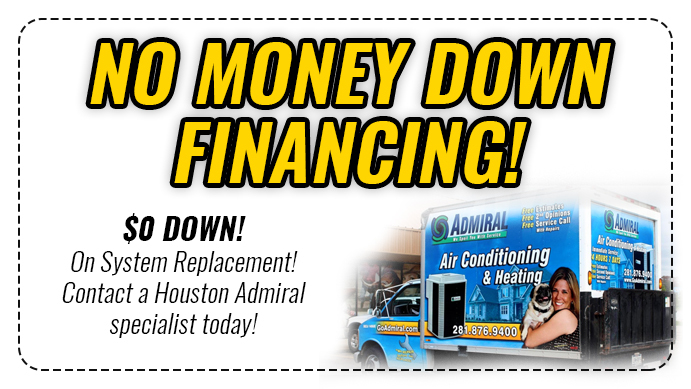 Houston Admiral Air Conditioning and Heating is available 24/7 for all your repair needs. You can always reach a live voice by calling 281-876-9400. They are happy to serve Spring and the surrounding areas. Learn more about their services by visiting https://goadmiral.com. It sounds counter-intuitive, but hiring a professional for your Spring Texas AC repair will save money. This is particularly true if you hire a company to inspect your unit on a yearly basis. Regular inspections can catch early signs of damage, before it becomes an expensive repair. Inspections also help to keep your family safe. Certain issues with AC units can sometimes pose fire risks or other hazards. A qualified technician can examine your unit for warning signs. You can then be sure these issues are corrected before they become dangerous. Unless you are also an HVAC professional, you should not inspect your own unit. There are many ins and outs of air conditioners that are unfamiliar to homeowners. It is not as easy as watching a few instructional videos online. Technicians receive many years of training and have on the job experience. This gives them a much higher level of skill than the average homeowner. They will be able to catch signs of damage that most individuals would miss. You can contact Houston Admiral at 281-876-9400 to arrange for your air conditioner inspection today. You can reach a live voice 24 hours a day, seven days a week. They never charge hidden fees for weekend or other after-hours calls. You can trust your family’s comfort in their very qualified hands. Visit them online at https://goadmiral.com to learn more about their services. Hiring a professional air conditioner repair service in Texas is much safer. There are many dangerous parts and chemicals inside AC units. Unless you have received the proper training, it can be dangerous work. Many accidents that happen at home are the result of appliance repair gone wrong. It is much safer to trust this type of work to the experts. Trying to learn how to repair your unit on your own is too risky. Technicians are able to notice and repair even minor signs of damage. Most homeowners would miss these other, less obvious cues that there is a problem. As a result, it can put you and your family at risk. Faulty AC units can cause fires and chemical leaks. These risks are particularly high during the summer months. Hiring a professional will reduce the risk to your family’s safety. If you are looking for high quality AC repair, contact Houston Admiral today. They are proud to offer residents of Houston, Spring, and other areas the best repair in Texas. They have highly qualified technicians ready to help you. You can always reach a live voice by calling 281-876-9400. They offer a 10 year warranty on their parts and labor. You know you can trust your family’s comfort and safety to their capable hands. Visit them online at https://goadmiral.com to book an appointment or learn more. Finding the best air conditioner repair in Spring, Texas does not need to be difficult. Look for a location that offers excellent customer service, flexible hours, and warranties. These qualities let you know that the company you hire stands behind their work. It also means they will prioritize your comfort. When it comes to air conditioner repair, prioritizing comfort and service is key. 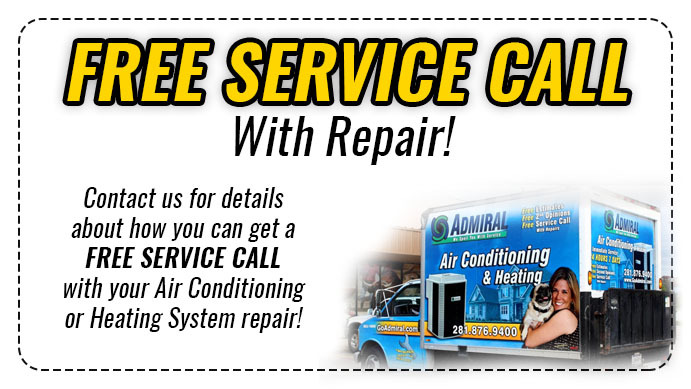 Residents of Spring can contact Houston Admiral Air Conditioning and Heating for their repair needs. Houston Admiral employs only the best and most qualified technicians. They offer their customers 24/7 service, with no extra fees for after-hours calls. You can learn more by visiting them online at https://goadmiral.com. You can also contact them by calling 281-876-9400. If you are looking for the best air conditioner repair Spring TX, contact Houston Admiral today.